Nasa’s first-of-its-kind plan for an all-female spacewalk has fallen through – partly because there were not enough spacesuits available to fit the women astronauts. Instead, a male NASA astronaut, Nick Hague will join fellow NASA astronaut Christina Koch on March 29, after a successul first mission with Anne McClain on March 22. It was the first in a series of three spacewalks completed at NASA’s International Space Station to install powerful lithium-ion batteries for one pair of the station’s solar arrays. In the past, missions have been all-male or male-female and the spacewalk on March 29 was hoped to be NASA’s first all-female venture. But mission managers decided to adjust the assignments, partly due to spacesuit availability on the station. 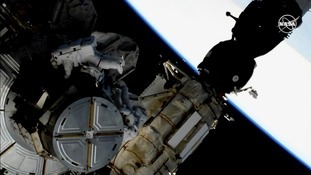 NASA astronauts Nick Hague and Anne McClain conducted the first spacewalk in this series on March 22. Hague and fellow NASA astronaut Christina Koch now are preparing to conduct the second spacewalk Friday, March 29, to continue the work they started. McClain learned during her first spacewalk that a medium-size hard upper torso – essentially the shirt of the spacesuit – fits her best. Because only one medium-size torso can be made ready by Friday March 29, Koch will wear it. McClain previously tweeted pictures of her trialling out the sizing on her spacesuit and sharing her surprise that she'd grown two inches taller than her height on Earth. This is thanks to the effect of microgravity on the body and astronauts will return back to their normal height once they are back on solid ground, NASA explains. It is hoped that McClain will now perform her next spacewalk – the third in this series – on Monday April 8 with Canadian Space Agency astronaut David Saint-Jacques. McClain and Saint-Jacques will lay out jumper cables between the Unity module and the S0 truss, at the midpoint of the station’s backbone.